Dynamic pricing strategies are now accessible to businesses of all types and sizes. It has become an essential part of the competitive landscape of eCommerce. How effectively and precisely you apply dynamic pricing principles would determine your success and failure in the extremely volatile business space. 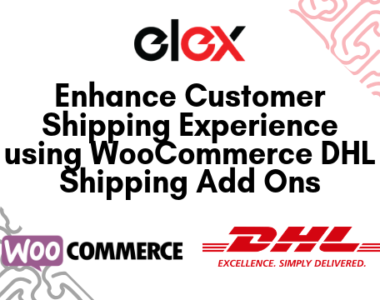 If you are running a WooCommerce store, our ELEX Dynamic Pricing and Discounts plugin would be an apt companion for your pricing strategies. If you wish to directly go to the capabilities of the plugin, visit the live demo for a hands-on experience. In this article, we will throw light into some of the effective WooCommerce Dynamic Pricing strategies that you can adapt to make more profit. Dynamic pricing tools, like our plugin, make it extremely simple to apply complicated pricing rules to your WooCommerce store. It enables you to make profits with diverse strategies that you can improvise based on periodic performance insights from your eCommerce analytics reports. However, it is a great idea to keep in mind some basic ideas while implementing dynamic pricing strategies. Let’s take a look at a few of these strategies that will help you hit the bull’s eye with dynamic pricing. One of the underlying principles of dynamic pricing is that you cannot treat all the customers alike. A lot of factors come into play here, which could be used from an efficient segmentation of your customers. You need to constantly evaluate how much value is added by each new customer that you acquire. It should give you enough insights to understand what is unique about a particular customer. And, this insight should effectively lead you to the next strategy that you can implement on a specific customer successfully. When you analyze the lifetime value of each of your customers, you will most probably find out that a small percentage is contributing to the highest revenue share. It will be really good if you can consistently identify such customers and dedicate more focus on such a segment. Though a lot of markets are price sensitive, it is not always the lower price that the customers are looking for. Just like you have specific parameters to determine the perceived value of a customer, the customer too will have parameters to determine the value of the store. For example, one high-value customer of yours purchase from you solely because you offer the best deal all the time. At the same time, another might be coming back because of the efficient customer support that you offers. The ability to know this difference becomes extremely important so that you can take a more informed approach to each one. An essential aspect of this would be to offer a personalized pricing plan for your high-value customers. Offering specific pricing patterns to dedicated customers becomes one of the primary steps in this direction. In fact, offering personalized pricing to specific customers is quite easy with the help of our Dynamic Pricing Plugin, as you can make use of its features to offer personalized pricing plans. For every pricing rule that you create, you can specify the benefactors based on considerations such as a ‘minimum number of orders’ in their purchase history. Similarly, you can also set up a ‘minimum total spending’ from their past orders to be eligible for a dynamic pricing rule. You can also handpick some of the most valued customers on your store, and add their email IDs to be able to be entitled to the offers. For each pricing rule that you create with the plugin, you can specify restrictions that make only selected customers eligible for it. You will have a lot of confidence in implementing pricing strategies if you know exactly what makes your store stand out in the competition. This is one of the early things that you need to do before implementing any serious marketing strategies. Once you are able to pinpoint that one factor that really gives you the edge, the rest of it will fall in place soon. This differentiating factor would be one of the prime reasons that you acquire new customers or retain existing ones. Being able to consistently improvise without deviating focus from this would help you a lot in implementing pricing strategies. For every new pricing strategy that you implement, you can test the impact on your USP. This will keep you keep rooted to your basic principles while attempting newer, out-of-the-box strategies. In fact, it is a pretty established strategy to consider the fluctuating demand tendencies before pricing a product. In the current scheme of things in eCommerce, it is pretty easy to maintain a dynamic pricing pattern based on real-time product demand. There might be several reasons why some products will be in high demand in certain phases of their life-cycle. As a store owner, you will have a better grip on pricing patterns if you are able to identify these specific patterns that will raise the demand of a product. A good use of analytics insights to be able to predict the peak demand of a product would help you immensely. And to practically reap the benefit of increased demand for a particular product, you should be able to keep your supply channels steady too. Though it is not an easy matter, if you are able to predict the demand for a product, you can apply better dynamic pricing strategies. You will also notice a general dip in the supply of a particular product in different markets, as a natural side effect the increased demand. This is probably where your dynamic pricing patterns can bring in exceptional results. If you want to borrow some of the strategies of big brands, you can in fact set a premium price tag when there are a supply crunch and a rising demand. This is somewhat in alignment to the next strategy we are going to discuss, but more definitive. If you are selling products that will have a peak demand only during certain time periods, you need to create a suitable pricing pattern accordingly. For example, if you are selling running clothes, you need to refresh your inventory based on the time of the year. Definitely, there will be a demand for specific seasonal clothing according to the change of seasons. You should be equipped with clearly-defined pricing strategies well in advance to be able to get ahead of your competitors. Compared to demand-based pricing, this is more predictable and you can assuredly configure the rules based on past sales patterns. However, even in above example of selling running gear, there is some underlying potential from the unpredictable outcome. Sometimes a prolonged winter might keep the demand for winter wear longer than normal patterns. In such cases, again you can manage to sell products without dropping prices as you would otherwise do. You might have seen the huge hype over certain products when they are first released into the market. Loyalists of the brand or product would compete to get hold of it irrespective of the pricing. If you are selling a product that is able to generate huge interest when it is first introduced to the market, you can very well price them at a higher margin. And, as the demand subsides, you can reduce the price to gain more sales. This is particularly true in the case of some of the top-selling mobile phone models of iPhone or One Plus. You might have seen the exact opposite of this strategy as well. For example, air tickets are mostly priced at their lowest when they open for a particular route. And, as the date of the journey comes closer, the demand for the ticket rises, and so does the price. WooCommerce dynamic pricing tools offer great options to configure time-based prices. For example, using our plugin, you can set up a product at different prices based on dates. You can do this based on the assumption that you are offering the best price for a product at a specific time. 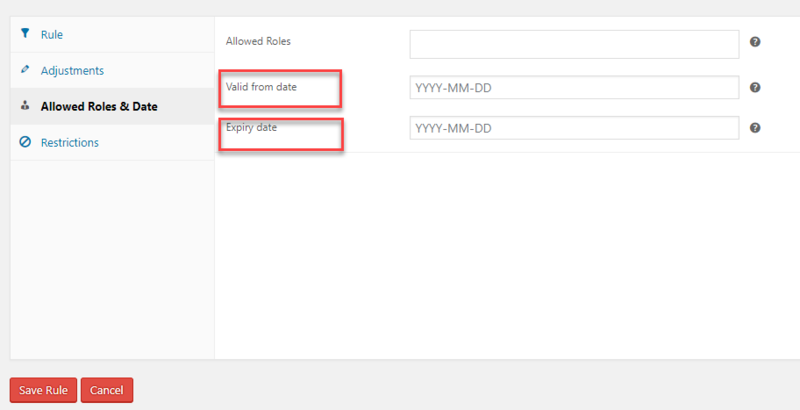 You can set up specific dates to apply a particular rule on your store. For example, if you are predicting a dip in product demand during a particular week, you can offer a discount on a particular product, just for that period. It might simply help you clear the old stock, and gain more returns from the fresh stock. When you set up a pricing rule with ELEX Dynamic Pricing and Discountplugin, you can also specify a start and end date for it to apply. With all the pricing strategies around, the word discount still has the power to entice a lot of shoppers. The trick is to create the best discount strategies so that your customers keep coming back to your site at regular intervals. However, you need to exercise caution while offering discounts. If your store creates a reputation of being a store that sells only discounted products, you might be distancing yourself from high-value customers. To avoid this, you need to plan and execute discount strategies in a calculated manner. WooCommerce, by default, offers the functionality of coupons with which you can set up discounts. However, with coupons, you are mostly looking at simple strategies. When it comes to setting complex discount rules that have the potential to generate more sales and revenue, you need more advanced tools. Fundamentally, you can offer discounts in three ways – a flat rate discount, a percentage discount, or a fixed reduced price for the product. With the help of the ELEX Dynamic Pricing and Discounts plugin, you can set up all these discounts efficiently. You can create discounts at the product, category or cart levels, or even by combining products or categories together. 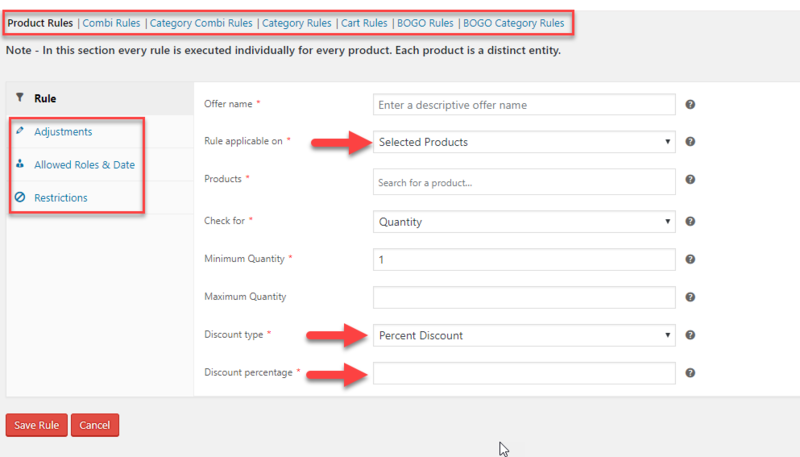 For each of the discount rules created, you can create exceptions based on user, user role, date, maximum discount amount, etc. This way, you will have more control over your strategies, as you can make sure the discounts are never eating into your profits. You can create discount rules based on a lot of parameters and then make exceptions for each including their order with which they will apply. Sometimes when you are starting out, it is not a bad idea to sell a product below its market value. You can achieve this by carefully monitoring all your competitor prices. Consider offering the lowest price in the market, even if it is not a profitable deal for a specific product. The trick is, by sacrificing the profit margin of one product, you can get a lot of customers to your store. And, naturally, other products on your store will gain more attention from the customers, which you can sell in a good margin. For this strategy to be successful, you might have to choose a product with the least price to acquire. For more information on the AdaptXY Dynamic Pricing Plugin, visit the product page. If you have any queries regarding a specific use case, please contact our support team here.